Reckoned as one of the involved companies in the industry, we Natural Steels are extremely immersed in providing Female Branch Tee to our nationwide clientele. High-grade raw materials are used to manufacturer these female branch tee ferrule fittings which are acquired from reliable vendors. 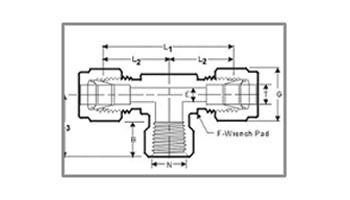 We manufacture, supply and export a complete range of Female Branch Tee Tube Fittings acknowledged for consistent performance and low maintenance. The offered range of products finds applications in various steel and other industries across the globe. We give utmost importance towards the excellence of products and have adopted strict quality checking measures recommended by the industry. We have been to deliver excellent quality ferrule fittings to petrochemical, Oil & Gas Refineries, Pharmaceutical, Automobile, Aerospace & Defense, Power Generation, Pulp & paper, Shipbuilding industries. Contact us today to request a quote for all of your metal needs or send your requirement on naturalsteels@hotmail.com. Natural Steels is one of the top manufacturers and suppliers of Tube Fittings from India. Our prices for Female Branch Tee are very reasonable. Please click on contact us now button or click here to send your requirement. Natural Steels maintains a high-inventory of Tube Fittings and can export them at the best price for Female Branch Tee. Natural Steels is a leading manufacturer, supplier, and exporter of Female Branch Tee from India. 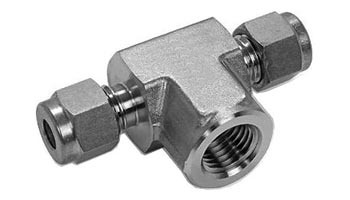 We maintain a huge inventory of Tube Fittings and you can buy Female Branch Tee at the best price. Please click on Contact us now button or click here to send us your complete requirement to Buy Female Branch Tee from Natural Steels. Exporting Female Branch Tee to Singapore, Malaysia, Hongkong, Thailand, Indonesia, Taiwan. Other countries includes Afghanistan, Albania, Andorra, Austria, Bahrain, Bangladesh, Bhutan, Brunei, Belarus, Belgium, Bulgaria, Cambodia, China, Cyprus, Croatia, Czech Republic, Denmark, Estonia, Egypt, Finland, France, Germany, Greece, Georgia, Hungary, Iceland, Ireland, Italy, Iran, Iraq, Israel, Japan, Jordan, Kazakhstan, Kuwait, Kyrgyzstan, Lebanon, Latvia, Latin America, Liechtenstein, Lithuania, Luxembourg, Malta, Moldova, Monaco, Maldives, Mongolia, Myanmar (Burma), Nepal, North Korea, Netherlands, Norway, Oman, Poland, Portugal, Pakistan, Palestine, Philippines, Qatar, Russia, Romania, Russia, San Marino, Serbia and Montenegro, Slovakia, Slovenia, Spain, Sweden, Switzerland, Saudi Arabia, South Korea, South Africa, Sri Lanka, Syria, Tanzania, Tajikistan, Thailand, Turkey, Turkmenistan, Ukraine, United Kingdom, United Arab Emirates (UAE), Uzbekistan, Vietnam, Yemen.